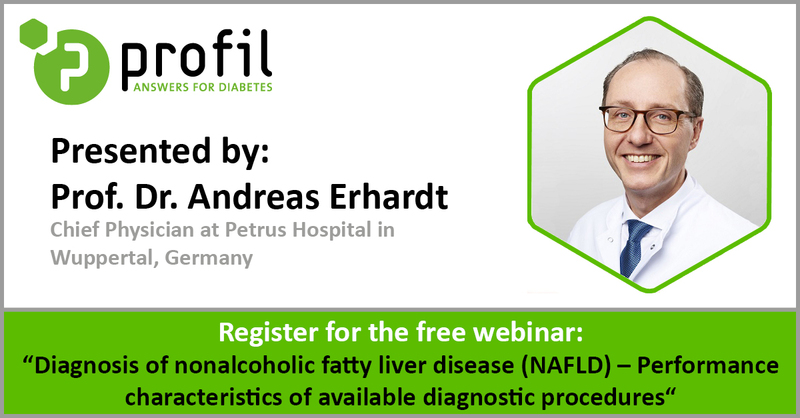 Free Webinar: "Diagnosis of NAFLD"
"Diagnosis of NAFLD – Performance characteristics of available diagnostic procedures"
The live webinar will take place on May 8th, 2019 at 4 PM CEST. The key essentials of NAFLD and NASH. The different kinds of diagnostic methods and techniques available including their strengths and limitations – from an expert’s perspective. The interpretation of clinical trial data on available diagnostic procedures including future perspectives. Nonalcoholic fatty liver disease (NAFLD) is the most common cause of liver disease worldwide (prevalence estimates ranging from 25% to 45% in most studies), increasing in parallel with that of obesity and diabetes. In the US, about one-third (100 million adults) of the population is affected by NAFLD, and 5% by nonalcoholic steatohepatitis (NASH), respectively. Patients with NAFLD overall, and those with NASH in particular, are at increased risk of mortality from liver disease (13%), and more commonly from cardiovascular disease (25%) and malignancy (28%) [Rinella ME, Jama 2015; 313: 2263-2273]. Diagnosis of NAFLD and NASH comprises a portfolio of procedures, including e.g. laboratory values, quantitative ultrasound parameters, fatty liver index, biomarker panels, transient elastography, or magnetic resonance elastography, as well as liver biopsy. The webinar will shed light on the Pros and Cons of each method, thus enabling both physicians to choose the adequate set of diagnostic procedures for a patient with NAFLD or NASH, and support those in the planning phase for future clinical trials on NAFLD/NASH. Prof. Dr. Andreas Erhardt is Chief Physician for Internal Medicine, Gastroenterology, Hepatology, Diabetology and Nutrition Medicine at the Petrus Hospital in Wuppertal, Germany.